NIA CHARLESTOWN NEVIS (October 07, 2014) — Premier of Nevis and Minister of Finance Hon. 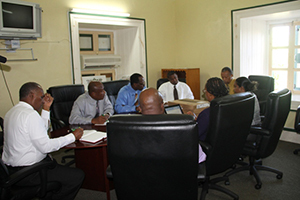 Vance Amory met on Monday October 06, 2014, with St. Kitts and Nevis Labour Commissioner Spencer Amory, at the Nevis Island Administration’s (NIA) head office at Bath Plain. The Premier received an update from the Labour Commissioner on the Long Service Gratuity Legislation passed in the National Assembly on July 17, 2013. The Labour Commissioner said that November 01, 2014 was the projected date for the activation of the labour policy. He also said the policy would benefit retired workers who had been in continuous employment with one employer for at least 10 years. Persons who qualify for that benefit would be paid a one-time payment within 90 days of retirement. The Labour Commissioner also spoke of meetings that his advisory committee ha. According to him, during those meetings the increase in the minimum wage received much attention. He said the committee also had discussions on work ethics in the workplace, money management of employees, the quality of the local labour market and Labour Market Information System. Premier Amory gave his assurance to the Labour Commissioner that his Administration would continue to do all that it had been doing to improve the quality of the labour force on Nevis and support any benefit that would eventually come to workers. He thanked the Labour Commissioner for the visit and the information he had imparted. Also present at the meeting were Permanent Secretary in the Premier’s Ministry Wakely Daniel, Assistant Secretaries in the Premier’s Ministry Mrs. Angela Scarborough and Kevin Barrett, Assistant Secretary in the Ministry of Tourism Carl Williams and Director of Labour on Nevis Gary Liburd.